Ubiquitous sensor network is a technology recognizing information such as surrounding temperature, light, acceleration and magnetic field by laying very small-sized independent wireless sensors into physical spaces such as buildings, roads, clothes and human body. I-Search is researched for measuring distance and developing its algorism using RSSI in existing Cell ID method while LBS method was being researched. 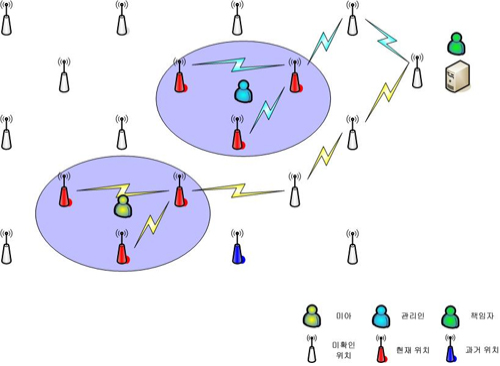 We developed Sensor Network equipment of 2.4GHz bandwidth for the experiment. This equipment is a platform providing capability of location recognition without changing existing environment using characteristics less affected by installation environments which is an important feature of USN. This research has its goal that identifies the location of targeted objects using a feature of USN as much as possible, which can construct a network between surrounding nodes by itself. I-Search consists of 3 layers including Physical Layer, Network Layer and Application Layer. Physical Layer is a USN equipment equipped with CC2420 chip that can support low-powered CPU, MSP430 and IEEE 802.15.4 standardized communication, and it includes hardware design and basic communication range. I-Search is capable of programming and serial communication through USB communication, and it is designed to consume power only for the necessity equipped with its minimally integrated circuit consisting of BSL Downloader, FIX & END Node, Sink Node. Network Layer is in charge of Network Management and Routing Management between each node, and designed to be able to do Ad-Hoc communication. Network Layer is in charge of Ad-Hoc Network provided by USN and database integration and its management in PC. Application Layer consists of Web Application and GUI used by users, and it is used for identifying the location of corresponding nodes by collecting and investigating data received from network layer. It first prints acquired data to PC, and then prints data remotely by connecting Web. If fixed sensor nodes transmit Packet (Searching NodeID, Catched NodeID, RSSI), sink nodes send data to I-Search Server by Serial communication, and I-Search Server stores those data to database. Activated nodes in AdminNode program displays locations of nodes through web application after identifying location and location tracing process. After Field Test, the value of RSSI was proved to be abruptly varied near 5m and reduced as distance increases. error rate depending on RSSI weight is proved to be highest between 7 and 9m. That's because the value of RSSI is abruptly varying near distance of 5m. Its deviation is 5m which is similar to those of GPS. This research is finally carried out for being used in theme park and exhibition hall by replacing expensive GPS. Therefore it is possible to replace GPS where GPS is not supported, such as inside of building and environment which is moving power and size-limitation. But, for actual commercialization and application, obvious deviations with limitation dealt with should be basically improved. As the results based on experiments so far, more information in addition to RSSI is required to improve exactness of location recognition. Laying fixed nodes by a specific distance which is a prerequisite of this system is assumed to be difficult for actual environment making it almost near ideal experimental environment. In order to counter-act this condition, application that is flexible for coordination is necessary. If this system is implemented using C2431 Location Engine(TDOA) made by Chipcon, it is possible to precisely trace location with simplicity.